If you’ve followed this blog for a while, you might have noticed me comment occasionally about ways in which the NZ Department of Conservation’s safety policies influence an experience in the back-country. I refer to things such as asset numbers being stamped everywhere, gratuitous warning signage, and removal of bunks from huts to comply with a law intended for urban environments. When I’ve discussed these issues with tramping friends, the Cave Creek Tragedy of 28th April 1995 has usually been cited as the reason, and it’s not so much a presumption. This Thursday will be the 16th anniversary of the Cave Creek Disaster. Besides the impact it had on many people and families, the accident also had a profound impact on DoC and its management of much of New Zealand’s outdoors. At the time it was the most serious accident to have occurred in modern times on the Conservation Estate, short of aircraft accidents. The implications were not shaped just by the accident itself, but in the numerous factors and fundamental faults in DoC’s design from the beginning. These flaws created a situation that would very likely have led to a serious accident sooner or later. From time to time I’ve met people (often from outside New Zealand) who needed explanation of what happened at Cave Creek. Despite having followed news at the time, and remembering bits from a television documentary that screened in 1998, I was also young when it happened. It’s only after trying to explain the significance of the event that I found I really didn’t know as much detail as I thought I did. Therefore I’ve tried to research things from (easily) available sources, and collated it here. I’ve attempted to present things accurately and hopefully opinionated bits will be easily distinguished. With a few exceptions I’ve removed names because I don’t think they’re relevant, but all of that should be fairly easy to discover for those interested. As always, I welcome any comments or corrections in the comments section. In 1995, Tai Poutini Polytechnic continued to develop its Outdoor Recreation course for those wanting a career in outdoor pursuits, with training in a wide range of outdoor activities. 40 students took the course that year. To make things manageable they were split into two groups of 20. Between the 27th and 28th of April, Group A and then Group B would take part in a field trip meant specifically for non-recreational studies. In essence, it was a guided visit to the bush, to learn a few things and foster an appreciation of the environment in which they’d likely be working. This time they’d visit an area that included the Cave Creek Resurgence, and a platform located 30 metres above a chasm would allow viewing of the point at which Cave Creek emerged from an underground cave system (here it is on a map). On the day before the accident, Shirley Slatter, the Information Manager of DoC’s Punakaiki Visitor Centre, accompanied course tutor John Skilton and 20 students of Group A to the platform. As people stood on the platform, Ms Slatter thought she noticed it move slightly. This concerned her, and afterwards she managed to persuade Stephen O’Dea, the new manager of the visitor’s centre who’d not yet seen the platform, to return with Group B the following day and check it out. Ms Slatter even went as far to suggest that people probably shouldn’t be allowed to crowd onto the platform at once. It simply never occurred to her that the situation had been so serious, and for then at least she was content with reporting her concerns. At about 11.25am on Friday 28th April, Ms Slatter had been held up at the back of the group, with Mr Skilton (the course tutor) and three students. Meanwhile Stephen O’Dea and most of the students in Group B crowded onto the platform. Several students began to jump up and down, shaking the platform for some fun*. Unexpectedly the platform surged forward and dropped, then fell 30 metres into the gorge below. Everyone standing on the platform fell with it. Ms Slatter, Mr Skilton, and three remaining students who’d lagged behind, reached the location shortly afterwards. At first only the two adults realised there should have been a platform, but soon they all began to hear shouting coming from below. Youtube’s hosting a short video that shows the area into which the platform fell. The brief description of the accident above, as well as most of the details below of the investigation, are paraphrased and summarised from the Commission of Inquiry into Cave Creek, which was produced during the months after the incident, and released in November 1995. In that report, Part One investigates factors that caused the accident to occur (with which I’m mostly interested here), whereas Part Two investigates the emergency response following the accident. Another source of information I’ve used, especially for conveying an idea of the feelings and opinions about various issues from those outside DoC, has been the Federated Mountain Clubs Bulletin archive which is available online for full context. In this post, I’ve focussed almost entirely on the outdoor recreation side of DoC, which is what interests me most. DoC is a department that works in a much wider domain (working with wildlife for one), but I’ve ignored that side of it here. The events of the rescue and recovery that followed are a detailed public record in Part Two of the Commission of Inquiry Report, linked above, and I’ll not dwell on them here. A total of 18 people fell with the platform. 14 of them, including DoC worker Stephen O’Dea, died either immediately or very soon after impact. The other four students who fell survived with injuries, mostly serious and of a nature with which they continue to live. Immediately after the accident, inspections were carried out on 520 comparable structures throughout conservation land**. 65 were closed for repairs due to their assessments being inconclusive or worse. DoC also established a toll-free “safety watch” phone, with which people could report actual or potential hazards observed during their visit to conservation areas***. Today, as was even the case soon afterwards, it’s no big secret that Cave Creek wasn’t a freak accident, or unpreventable. It was a tragic consequence of the way that the Department of Conservation had come to be organised and operated from its formation in 1987 through to eight years later. In 1987, after several years of consultation, the government of the day folded together the functions of the New Zealand Forest Service, the Lands and Survey Department, and both the Wildlife Service and the Archaeology Section of the New Zealand Historic Places Trust from within the Department of Internal Affairs. The resulting Department of Conservation also absorbed responsibilities of other smaller entities such as the NZ Walkways Commission. The change would mean that one combined entity could finally manage and balance the conflicting interests throughout the conservation estate with a unified approach, addressing a variety of problems that existed previously where several government entities would sometimes have been working against each other. Unprecedented for government departments at the time, DoC even had a legislated role to advocate for the environment—a reason why (to this day) DoC applies its expertise to submissions on major resource consents. FMC people have long experience of working with Forest Service and Lands and Survey staff, especially rangers. There should be a much greater commonality of purpose now with the formation of DoC. Our concerns for the future administrative relationship are three fold: (1) that the input of amateur users like ourselves is not lost; (2) that the principle of user pays is publicly evaluated before anymore implementation; (3) that DoC is given the skills and finances to pursue conservation objectives formulated through public consultation. – Federated Mountain Clubs Bulletin 88 (December 1986). Compounding the issue was that DOC had been launched with no central financial system; the eight DOC regions around the country and 34 districts operated more or less autonomously. It was difficult to track overall expenditure, at a time when offices were being set up, and physical assets divvied out in the environmental restructuring. The State-owned enterprises Landcorp and Forestry Corporation were believed to have taken the good vehicles, leaving DOC a motley collection. There was a tendency to grab assets whether needed or not, and wheeling and dealing became popular at district level: in one transaction, a grader was traded for a photocopier. Those who could splashed out on flash office fit-outs which incurred instant public condemnation from the environmental NGOs: the money was supposed to have gone on conservation gains, not Maurice Kain fabrics and pink-and-grey corporate interiors. It was partly for this perceived extravagance that government would come down so heavily on the Department. – A short history of the Department of Conservation (2007). When a new government came into office from 1990, its priority was not to foster conservation or recreation, and certainly not in a way largely funded by taxpayers. The Conservation Vote was allocated to Denis Marshall, only a Junior Minister outside the Cabinet, and with little influence in advocating for funding and resources amongst other ministers. Where emphasis existed on recreation, it tended to be targeted towards a small slice of ventures expected to pay for themselves. This was the birth of highly maintained “Great Walks”, predominantly targeted at overseas tourists and often nick-named New Zealand’s tramping super-highways by local users of the back-country. …experience has shown that with its great diversity in areas of responsibility and demand on its diminishing funds, DoC has not been able to service the walkway system adequately. […] At the present time DoC is forced to confine much of its maintenance activity of walking tracks to areas where there is likelihood of some cost recovery, hence the concept of the “Great Walks”. This has led to some overuse of such tracks, and while popular with overseas visitors, most New Zealanders having tramped these “Great Walks” once or several times seek other areas of interest. – Federated Mountain Clubs Bulletin 121 (August 1995). In its first few years, during which time the fatal platform had been conceived, designed and built, the Department of Conservation had never recovered from being an entity that was decentralised, inconsistent, internally disorganised, under-staffed and under-funded, despite the absolute dedication of many of its employees, who’d often work voluntary overtime to get the jobs done with minimal resources. From the time of the tragedy, information thoughtfully provided by club members on the Coast showed DoC’s West Coast Conservancy grossly under-staffed because of inadequate funds. There were at least fifteen vacancies over the whole of the Coast, and a constant turnover of staff, especially at Punakaiki. TV showed clearly, too, that use of nails rather than the usual nuts and bolts was the primary cause of the collapse. Four confidential reports available only to [Cabinet] addressed the cause of the collapse, an internal DoC assessment, an external DoC report, and reports from the Police and Labour Department (Occupational Safety & Health). Based on these, the Cabinet decided to hold a Commission of Inquiry into the cause of the collapse. They took almost a week to carefully narrow down the terms of reference on DoC, and the direct causes of the tragedy, and avoid the underlying causes due to Government, such as underfunding and high staff turnover. – Federated Mountain Clubs Bulletin 123 (March 1996). A lack of money was not the cause of the Cave Creek collapse. None of the department’s witnesses suggested it was. Neither do I. But in my view, the inadequacy or otherwise of funding is highly relevant to this inquiry in providing a background against which the evidence and submissions can be judged. – Section One, page 43. The position at the Punakaiki Field Centre well illustrated the under-resourcing/under-staffing dilemma. It is clear from the evidence that the prevailing culture was one of seeking to do more with less and of working long hours in order to cope with changing priorities—shifting the goal posts, as one witness put it. – Section One, page 50. As the “dominant” cause of collapse, Judge Noble found from engineering evidence “that the platform was not constructed in accordance with sound building practice. This resulted in a total and catastrophic failure”. Besides the dominant cause, however, he found over 30 “if only” circumstances, which all came together. Six such circumstances were properly identified as secondary causes, whereby if things had been done differently the accident would not have occurred, or at the very least would have had fewer casualties. One of these secondary causes, and the first mentioned, was the failure to provide qualified engineering input into design and approval of the project. Essentially, the platform had not been either designed by or approved by an appropriately qualified engineer. The height and steepness of the cliff face meant that a geo-technical report should have been sought about the site prior to design, but was not. The design documents were also not suitably specific, and weren’t even known to exist by those who eventually assembled the platform on-site. Judge Noble stressed that these causes needed to be carefully considered against the diversity of services provided by the Department, its structure to this point, the resources available, the staff and pressures being placed upon them, the adequacy of resources, and increasing demands. With these in mind, it’s easier to appreciate how the design and building of the platform was carried out by workers in the West Coast Conservancy who weren’t qualified engineers or adequately familiar with New Zealand Building Standards, despite being extremely dedicated to their jobs and prepared to do “anything asked” of them towards getting more done with less. Staff in the conservancy were responsible for activities and facilities within its boundaries, but nobody in the chain had sufficient training to even recognise that specialists needed to be consulted. Short staffing problems fostered further mis-communications when it came to approvals of plans. Construction of the platform occurred at hap-hazard intervals as time allowed between other duties, during the months between December 1992 when a pre-fabricated structure was flown to the site, and April 1994 when concrete steps were finally poured. When the project of the platform and surrounding tracks had been stalled for a while, a working bee was called from about 20 DoC staff within the area. Most had had little to do with the project until this point, the platform’s construction was seen largely as just another part of the related track upgrade works rather than a structure of its own, and this is when most of the on-site assembly occurred. No plans were taken to the site, nobody on-site considered there might even have been plans, and there was no clarity about who was in charge or taking responsibility for the work at the time. The platform that was finally built did not represent the original plans. A seven metre section of steel, intended as a structural link between the platform and its counterweight of concrete steps, had never even reached the site. When the concrete was finally poured next to a platform that was believed to be already completed, it went completely unrealised that such a critical component for the original design was missing. A bag of bolts which had reached the site was never used. The report concluded that the platform should have been designed by a qualified engineer, the plans should have been followed, that construction should have been carried out by suitably skilled tradespeople, and that the project should have been properly planned, sequenced and managed. The do-more-with-less culture within the department had led to none of this happening, however, just as it led to nobody considering that it even needed to happen. One of the Commission of Inquiry’s findings was that the Department of Conservation had clearly broken the law, both the Building Act, and the Health and Safety in Employment Act. As a national entity, the Department of Conservation had been slow to react to the recently introduced Building Act of 1991 which introduced the requirement for Building Consents. The decentralised structure meant that some conservancies had things well in hand, but others didn’t and communications from head office had been confusing. When a person within the West Coast Conservancy who was knowledgeable of the relevant part of the law discovered that the platform existed, and realised it had no consent, it was found that the original plans had little relevance to the structure anyway. New plans were hastily and retrospectively thrown together, on a small budget, with the help of a volunteer exchange student from Germany, but the plans made incorrect assumptions about the inadequate design of the foundations of the platform, which would have been impossible to determine without pulling it apart. In the end, the retrospective application was never even submitted, because a misunderstanding with the Buller District Council caused the DoC staff member to think that it made no sense to submit a building consent application for a structure that already existed. When considering the issue of inspections, the Inquiry noted that the platform was never formally inspected during or after its construction. DoC had systems in place to inspect certain structures, such as bridges, even if the inspections weren’t always of the highest standard. The viewing platform, however, had remained entirely off the record and was never entered onto a list of structures requiring regular inspections. Those who built it merely considered the platform “as part of the Cave Creek upgrade works which included the track and associated boardwalks and stairs, and not as a structure in itself that required any formal inspection”. Inspections might also have been the responsibility of the Buller District Council, which appeared to have better procedures in place than the West Coast DoC Conservancy. Unfortunately the absence of a Building Consent application and subsequent paper trail meant that the council had no more knowledge of the platform’s existence than most of DoC. Informal and ad-hoc inspections occurred by those who built the platform, and also by an acting Field Centre Manager who—for separate reasons—believed there were problems with the railings when young children were concerned. A critical conclusion of Judge Noble, however, was that even if inspections had been carried out they most likely would not have detected the most serious problems with the platform, due to usual assumptions with inspections that design documents would be accurate. A further issue brought to light was a lack of warning signs, although this was probably the least significant of identified secondary causes. Warning signs that suggested a maximum of 5 people had been ordered, but were since forgotten and remained in a workshop. Had the signs been in place the platform might not have collapsed, although Judge Noble also pointed to evidence from both DoC and qualified engineers that the signs had not been intended for safety, but only for practicality in standing on the platform, and that a design for such a structure should always be expected to withstand as many people as might reasonably crowd onto it. Even had the signs been installed, it’s likely that the platform would have collapsed sooner or later. The pre-eminent secondary cause was determined as Systematic Failure. DoC’s submission to the inquiry had claimed that there was no single or deliberate wrong-doer, and that the accident had occurred due to “multiple errors, whose combination was not defeated by the systems of management, inspection and control which we have.” During the hearing, Alan Edmonds, a Deputy Director from DoC’s head office, also claimed that systems existed on the West Coast for building suitable structures. Whilst accepting that there were no single or deliberate wrong-doers, Judge Noble refused to accept that “existing systems” were at fault on the grounds that it was clear that “there was simply not in place (at least within the West Coast Conservancy) a management system structured to ensure that projects were adequately and properly conducted from conception to final inspection.” He pointed out that despite the existence of informal systems, some working better than others, no evidence had been presented to indicate the existence of any proper department-wide project management system, or that anyone in the organisation had been given the responsibility of preparing one. – Section One, page 37. I do not intend to denigrate or reflect in any way upon the veracity of any individual but, unhappily, I was left with the impression that these very capable people from the top levels of the department’s hierarchy simply did not seem to appreciate the concept of accountability in personal terms as it applies, for example, to the private sector****. Knowing one is accountable requires consciously acting in a manner that takes account of all known pitfalls. It requires one consciously to adopt a risk analysis and risk management approach. This concept scarcely needs explanation in the private sector, where being accountable may mean loss of wages, a job, a business or profits, or damages, or some other form of financial disadvantage. But in this part of the New Zealand public sector I am left with the uneasy impression that the understanding of accountability is blurred. I accept that those in the department’s ranks affected by the tragedy have and will continue to suffer emotionally, but otherwise it is difficult to see what Cave Creek really means. For the future, it needs to be clearly understood that failure to be accountable will result in some real and tangible sanction. – Section One, page 114. What caused this catastrophe to happen? Standing back and viewing the evidence objectively, that I am left with the overwhelming impression that the many people affected—victims and their families, department employees and their families, and others closely associated with the disaster—were all let down by faults in the process of government departmental reforms. Society always likes to feel it is progressing, but there are lessons for society in all of this. No government organisation can do its job without adequate resourcing. In my opinion, it is up to governments to ensure that departments charged with carrying out statutory functions for the benefit of the community are provided with sufficient resources to enable them to do so. Here, the evidence is clear that the Department of Conservation lacked and continues to lack those resources. For future safety that must change. – Section Two, page 93. Shortly before the report was publicised in November 1995, the DoC Regional Conservator for the West Coast Conservancy, Bruce Watson, resigned. His decision was to the disappointment of many who knew him and did not believe him to be responsible for the accident, but he reasoned it was “to allow the Conservancy a fresh start” and as “a gesture of reconciliation”. Despite the report having found DoC in breach of both the Building Act, and the Health and Safety in Employment Act, clauses in both those acts at the time exempted the Crown from prosecution. Whereas a regular business would most likely have been prosecuted by the Department of Labour, nothing similar occurred with the Cave Creek collapse. Nevertheless, approximately $2.6 million was paid to the victims’ families in compensation. The government of the day argued that responsibility for the accident lay within the department itself, and that under-resourcing of DoC could not be used to explain incompetence by the organisation. Soon after its release in November, Prime Minister Jim Bolger criticised the findings with an unfortunate comment that the platform failed “essentially because it lacked about $20 worth of bolts to hold it together”, a comment that haunted him for some time. Denis Marshall, Minister of Conservation since the residing government had taken office in 1990, responded to the report in parliament. As Minister I am responsible for the Department of Conservation, and in that context the buck stops with me. In this regard I have considered my position very carefully and have thought deeply about it. My resignation would not be a remedy. My resignation would not bring these young people back to life. My resignation would not fix things. It would not remedy the systemic problems that contributed to this accident. It would be a way of emphasising the fact that I am profoundly sorry. But for all the symbolic power of a resignation, I do not intend to proceed from sorrow to abdication. – Parliamentary Debate—Denis Marshall (Minister of Conservation), Wednesday, November 22, 1995. The design and construction of the platform read like a horror story. The platform was designed by a motor mechanic, and built by a team of four people, none of whom had any appropriate qualifications, although two had totally irrelevant university degrees. I find it unbelievable that at least seven departmental staff were so incompetent as to knowingly condone the construction of a platform overhanging a 30 metre chasm without any engineering knowledge whatsoever. I find it unbelievable that the inspection was carried out by a forester, and then another inspection was carried out by an exchange student, again with no qualifications. The excuse of insufficient funding is a cop-out. The funding provided for this project was perfectly adequate for it to be professionally designed and inspected to the best building standards. Anyone with knowledge of the building and construction industry can be left only with the impression that the Department of Conservation was a bungling bureaucracy incapable of building the platform either efficiently or safely. – Parliamentary Debate—Nick Smith (MP for Tasman), Wednesday, November 22, 1995. I quote from the report of the commissioner, Judge Noble: “The department was negligent. It acted unlawfully.” It is the Minister’s duty to make sure that the department acts lawfully. It is the Minister’s duty. He sat in Cabinet when the Building Bill, which became the Act, was discussed, and when it was debated whether it should bind the Crown. Cabinet decided it should. But did the Minister say to his director-general: “Does this affect our department? Are we covered? Are we observing our duties?” Did he? We have not heard. I think we can reasonably assume that he did not. […] This Minister must resign. – Parliamentary Debate—Jim Sutton (MP for Timaru), Wednesday, November 22, 1995. Denis Marshall eventually resigned roughly a year after the accident, at about the same time as the government announced a “Green Package” in its budget which allocated $11.5 million to DoC for “targeted programmes”. The budget was criticised for still leaving existing programmes and staff salaries inadequately funded. Even so, something suggested by the Commission of Inquiry was that DoC’s problems were far deeper than simple lack of funding. The loopholes that had prevented the Government from being prosecuted continued to exist for another six years, before a new government finally bound its departments to the same standards as everyone else. Scepticism still existed about how meaningful it would be, such as an editorial from the NZ Herald which argued that having the government prosecute itself made little sense, and only the Private Sector could ever be truly accountable. It’s my personal view that there was a wealth of evidence for prosecution (against DoC individuals) and it’s inconceivable that the Crown Law Office and police could come to a different opinion. “The Department’s core functions have never been costed on a zero base. The Department is therefore not well placed to put forward an objective case for additional funds where its obligations increase. – SSC Review of the Department of Conservation, 16th December 1995 (PDF). In other words, the fact that DoC really didn’t know where its money was going, or whether it was being spent usefully, meant it was tough to justify asking for more money. All of this, therefore, meant major changes within DoC, not just to improve and standardise its internal project and risk management systems, but to improve the systems that would help DoC to keep tabs on what was actually happening. It would be a reversal of the policy-to-date of having a de-centralised organisation towards one that would be more coherently run from three regional offices, now reduced to just the Northern Regional Office and the Southern Regional Office. and more or less everything else. The VAMS informs staff when structures are due for inspection or other maintenance work and sends an automated message to the relevant area manager. […] One of the spin-offs of developing the VAMS is that we now know how much it costs to own our visitor infrastructure. We have reviewed our visitor assets and reported on this to the Government. As a result, the Government committed $349 million over 10 years, starting in 2002-2003, to implementing DOC’s Recreation Opportunities Review. – Cave Creek: Ten Years On. Asset numbers stamped on virtually every artificial structure with a connection to DoC have now become a ubiquitous part of many parts of the back-country. Today they’re generally accepted (and personally I try to joke about them), though early on in particular, recreational users sometimes took it as an insult that huts and structures they’d helped to voluntarily build, prior to the days of DoC, now appeared to have been usurped as “government assets”. The asset numbers were also an example, for some, of how they believed DoC was going too far in its changes. 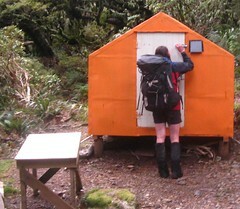 Last year I walked part of the Freshwater Track, Stewart Island, which crosses pakihi-like land. Some years ago, simple “steps” of 75mm diam. manuka, cut and nailed on the spot, had been laid flat to prevent damp patches from becoming boggy. They are simple, cheap, effective. Each one now has a numbered orange Formica plate double-screwed to it! Critical comments are made in the hut book about the expense to do this. No doubt each of these items is now computer-listed as “structures”, and hence capital assets, that require regular field expenses and computer up-dating and will be used as an argument for financial allocations in this area. – Ray Forsyth, Federated Mountain Clubs Bulletin 130 (November 1997). Early bush travellers recognised the difficulties in normal conditions of crossing Strachan Creek on this lowland route from the Burke to the Okuru River, and accordingly put up a two wire crossing over the chasm that Strachan Creek flows through. 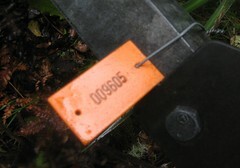 […] Later on, [the Forestry Service] replaced the two wire with a standard Forestry Service bridge. A falling branch snapped some of the “U” shapped aluminium droppers and the bridge was declared “unsafe”. However, the safety issue is now resolved, at least as far as DoC is concerned, by the removal of the bridge. They have removed what they saw as the liability, and it was justified by the zoning—remote experience—without further public reference. […] Far from making Strachan Creek “safe”, DoC has effectively increased the chances of a fatality here. Part of Forestry Service’s bridge programme was to reduce drowning fatalities in the hills, and in that it was very successful. That aim seems to have been forgotten. It’s not a lesson we should have to re-learn. [..] Look through any DoC strategy—it will be full of charts and figures from tourism boards to predict future usage. […] But you are unlikely to see any historical data on more traditionally used facilities as a planning starting point. [..] I know that DoC began only 10 years ago. But the Estate they took over to manage on behalf of taxpayers (which is still where more than 80% of their funds come from) has been used by outdoor Kiwis for much longer. Many structures superficially referred to as “recent Forestry Service” ones were often only replacements for earlier backcountry users’ versions. These have existed in one form or another for generations because of a consistent problem at a particular spot. Because little is written, it is too easy to wrongly assume that these facilities began with the Forestry Service. DoC has been driving the high standard tourist track-barrow for some time now. DoC’s own figures clearly show that the primary beneficiaries of that policy have been people from overseas. […] I have no problem with that except that DoC then says it has no money to maintain traditional recreational facilities for NZers in the hills. It clearly has the money which, by its expenditure, it has simply prioritised for the tourist industry, which I find completely unsatisfactory. The Conservation Act states very clearly that the Department should actively foster recreation while only allowing for tourism. – Geoff Spearpoint, Federated Mountain Clubs Bulletin 129 (August 1997). Since the Cave Creek incident DoC is leaning towards being responsible for only Rolls-Royce-standard structures, and getting quit of anything of lesser standard. Although the latter action, in Geoff’s view, may actually reduce public safety, it does protect the department from possible litigation. Better, in my opinion, to have erected a warning notice at the Strachan Creek bridge (complete with DoC disclaimer). – Trev Jones, Federated Mountain Clubs Bulletin 130 (November 1997). Ian Ewen-Street (Green Party List MP): Before the Department of Conservation demolishes a back-country hut, does it offer the opportunity for local organisations to take over responsibility for that hut so that it can remain available to members of the public; if not, why not? Hon. SANDRA LEE (Minister of Conservation): I have instructed my department to—as it was going to do, anyway—engage in widespread consultation with community organisations as part of the programme. There are some huts that will be demolished because they are past their physical use-by date and issues of safety can be involved, as with other structures. As the Minister I take that matter very seriously indeed, as I do the findings of Judge Noble after Cave Creek. The member can be assured that ultimately the decision rests with me, and I would have to be satisfied that the community endorsed the proposal and supported, possibly, in some cases, joint management or other arrangements between non-governmental organisations and the department. – Parliamentary Questions—Thursday, August 17, 2000. Strict adherence to the law is now a priority within DoC, as it should be, although at times there are still questions and disagreement around how DoC interprets law and responds. In 2008, it was noticed that the lack of a second Fire Exit for many six bunk back-country huts might have put them in breach of the Building Act, despite the intent of that requirement having been meant for urban developments. 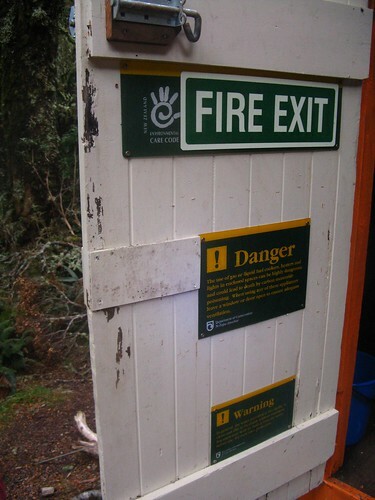 For some huts the situation was easily remedied by placing a new “Fire Exit” sign over a window, but for huts in which the design lacked such a window, the solution was trickier. In a flurry of legal conformance, and to the disbelief of some onlookers (including myself) who knew beyond a doubt that the number of beds in a hut has zero influence on how many will sleep in it, workers in some DoC conservancies were required to remove the sixth bunk from the hut ensuring that it could be officially labelled as a five person hut, thereby only requiring one Fire Exit. These removals slowed when it became clear that urgent changes to the Building Act were likely to succeed, allowing remote structures used for such purposes as back-country huts to be treated differently from regular urban accommodations. even when there’s nowhere to fit them. If there’s an irony in the outcome of the Cave Creek accident, I think it might be that by far one of the most visible changes in DoC’s attitude is the excessive signage that now decorates the back-country, notably warning signs, and particularly given that “signs” were probably the only secondary cause mentioned which would have been unlikely to prevent an eventual serious accident at Cave Creek. Today, even in remote and rarely visited places, nearly every bridge has attached signs warning that no more than one person should cross at a time, except recently constructed bridges which most likely have documentation of design for higher loads. Every constructed dwelling has giant Fire Exit signs, even if the one and only exit is painfully obvious. Standard warning signs tell people to ensure adequate ventilation when cooking, even when the only practical place to cook is outside. Additional signs remind people that they may wish to treat or boil the “provided water”, as likely to be a nearby river as not, despite a verbose acknowledgement that it’s probably clean and drinkable anyway. Overall I think the changes in DoC following the Cave Creek tragedy are a big improvement over the way that DoC worked pre-1995. I expect most would agree, even if some of the implementation has occurred in ways that haven’t always been a smooth ride. It’s helped that a more friendly government from 1999 onwards was prepared to commit more resources to the department, although (as mentioned) DoC’s original problems went far in excess of a lack of funding. The legacy of Cave Creek for DoC is perhaps to have been a turning point from whence the organisation became far more robust and reliable. There can never be a guarantee of no further accidents of a similar nature to Cave Creek, but what’s changed has meant that something that was once quite likely to happen sooner or later is now unlikely to happen at all. The viewing platform above the Cave Creek Resurgence has not been rebuilt. * The Commission of Inquiry following the accident did not find that the platform had been shaken hard during the collapse, only that someone might have been shaking it slightly. Ten years later on Paul Holmes’ show on Prime TV of Thursday 17th March 2005, Stacy Mitchell, one of the survivors, stated that he and several other students were shaking the platform hard when it collapsed. He’d not stated this clearly earlier for fear of being blamed for the accident. Given the nature of other evidence considered by the inquiry, it seems unlikely that this information would have made a difference to the outcome. *** Advertised in FMC Bulletin 124, page 7. **** There have been several references to the inherent superiority of the private sector when it comes to risk management—another was the 2001 NZ Herald Editorial. Personally I’m not convinced that it makes a difference, and there are examples of businesses in the private sector messing up risk management in similar ways. Case in point: The Pike River Mine Disaster of November 2010. I think the effective implementation of good (or bad) risk management practices is something that occurs independently of whether or not government is involved. This entry was posted in article and tagged article, department of conservation, favourite, federated mountain clubs, government policies, history, search and rescue. Bookmark the permalink. I am I doing a project at school on this disaster. I have found it much more interesting then I had expected it to be, and your report has been the most valuable resource that I have come across. Do you have any tips that I should take into account? Hi Jack. Great to hear from you and thanks for the feedback. I’m glad someone’s found it useful. As I mentioned, it’s really just a consequence of me having wanted to learn about it myself from a fairly lazy perspective of collating various internet resources. I’m not sure what tips I could give as it depends on what you’re trying to do, but if you can be at all more specific I might have some ideas. If you look through the Federated Mountain Club Bulletins archive that I mentioned, you’ll likely find a lot more opinion from closer to the date than what I cited, although keep in mind that it often is opinion and often slanted towards one particular viewpoint as the FMC represents outdoor recreation people primarily. Obviously it’s also a very emotionally-charged issue for many people, and even I have strong opinions on certain things which probably show through here, though not everyone thinks the same. One of the nicest things about the Commission of Inquiry Report is that much of the information that it includes is about as objective as we’ll ever have on the facts of the accident, but it’s still only one small part of the whole context of everything that happened before and after it was released. I’m over the moon to get a reply! Thank you so much. I am planning to present the project as a DoC information board, as one of the pointers from our teacher was to present it in a unique way. One area that I would like to explore is hearing/reading an account or something similiar from one of the survivors. Could you in any way assist me with this? Hi Jack. I’m afraid not. I don’t know anyone involved personally. Good luck with the project. Hi again. Just after writing that I re-read what you said and realised you weren’t specifically after contacts. I’m not too familiar with the first-hand accounts except everything that’s already part of the Commission of Inquiry if you haven’t already looked at that, and there’s a lot in there. Most of those directly involved, who came out of it, gave some form of first-hand account. There’s this Herald article to which I already linked. The NZ Film Archive also has some TV documentaries on file that you could ask them about. I searched from here and came up with “CAVE CREEK – THE FULL STORY OF A NATIONAL TRAGEDY” from 1998, “LIFE GOES ON. CAVE CREEK” from 2002 and “WHATEVER HAPPENED TO…?” from 2007. Whether that’s convenient or for you to chase up could be another issue, though. I hope this helps. Thank-you so much. I really appreciate the links and the advice. I will get busy, and if it’s okay, I’ll be back in touch soon. Thanks again for your help. I have one last question… After the accident 520 platforms were checked and 65 were closed as a result. Can you tell me why these 65 were closed? Is there a report detailing the issues with these structures? Or do you know anything about this? Hi Jack. No I’m afraid I can’t. I should have cited that reference for 520 and 65, but I’ve forgotten where it came from — likely an FMC Bulletin within 6 months after the accident, but I think I’ve also seen different numbers thrown around. If you want that kind of info, I’d suggest making a request to DoC. If you phone National HQ and get a two way conversation going, they might be able to help you narrow down what you want to ask for. Legally the Official Information Act states that DoC would have to give you the info if you request it specifically enough and there’s no good reason (like privacy or national security) to withhold it. The down-side of the OIA if you had to invoke it is that it kicks off a process where you might have to wait 20 working days (think 4 weeks) before expecting a response, and while they’re supposed to provide responses as soon as conveniently possible, many public servants are so overworked that OIA requests can get pushed aside until someone gets poked into looking at them properly… which might be just a few days before it’s due. I’d suggest phoning them first, and see if you can get to speak to a Knowledge Advisor person, who’d be very used to searching their records for all kinds of info… because it’s the kind of thing they do all day in government departments… and then finding the right people to confirm it’s okay to release. Given this was in 1995, don’t be surprised if many of the records are paper records that’d need to be requested from an off-site archive, scanned or photocopied and then mailed to you, so it’s not necessarily trivial for them, but making this kind of info public when requested is also the sort of thing that there’s funding for. Hi Jack. I’ll correct myself regarding the 520 and 65 figures. It came from “A Short History of the Department of Conservation“, which is the short history published on DoC’s own website. If you’ve read random articles and other blog posts around the place (and I guess you probably have), there are some quite different numbers out there describing exactly how many it was. Some are probably incorrect and some might depend on semantics of what were considered structures and what was considered ‘closed’, that kind of thing. Cheers. from memory of an article i read, that i can’t recall the location of, my understanding is, DOC produced a minimum design standard for every type of structure. any structure that didnt meet the standard and couldnt be remedied at the time resulted in the structure being removed or closed until it could be remedied . and they followed the standard to the letter, I read of a bridge on the nelson lakes to lewis pass walk that was just outside the guideline and DOC decided to remove it, it was in a place where someone had lost their life and the ladies husband organised the building of the bridge. given the outdoors can be an inherently dangerous place , one wonders about the logic of removing structures like these when even a two wire crossing is preferable to facing some of our watercourses in adverse weather. Hi Wayne. Thanks for the info. It seems to match the mentality of the time (and maybe some of that mentality is returning, sadly).